Is That a Stove Broiler or a Storage Drawer? Where is your stove broiler? If you aren’t sure, don’t think you’re alone. Many people don’t know where their broiler is, and some don’t realize that they even have a broiler. In one of today’s most notorious communication failures, most ranges don’t carry any obvious labeling of what’s where. Let’s look at how to determine if your broiler is in the drawer of your stove, or if its inside the oven. A stove broiler functions much like an upside-down grill, exposing food directly to very high heat from above. If you have an electric stove, your heating element — and, therefore, your broiler — is at the top on the inside of the oven. To use this function on an electric stove, you’ll need to place an oven rack in the highest position, to place the food close to the heating element. The drawer at the bottom of your electric stove, in almost every case, has nothing to do with the broiler function. Regardless of the make and model of your electric stove, it’s a safe bet that the drawer is designed to be used for storage of pots, pans and baking sheets. The confusion often comes from the fact that people store the stove-equipped broiler pan down there, leading many to believe that this compartment is indeed the broiler. Have a gas stove? Locating your broiler may be a bit more complicated. With some models, the broiler is the drawer at the bottom of the unit. These types of gas stoves have a single heating element at the bottom of the oven. This burner provides both indirect heat to the oven for baking and direct heat to the lower drawer. Other gas stoves, however, have two separate heating elements — the burner at the bottom of the oven compartment and a broiler burner inside the oven at the top. With these models, the broiler functions just as it does in an electric stove, simply requiring the placement of an oven rack in the upper position. If your gas stove has two heating elements, the drawer at the bottom is most likely for storage … but not always! Whether you have an in-stove broiler or a drawer, you can use the element to quickly cook foods and to give them a crust or caramelization on the outside. Many stoves come with a broiler pan, but you can broil on a regular baking sheet — either way, you must flip the food partway through cooking. When broiling your food, always keep a very close eye on it, as it can quickly go from nicely seared to burned. You may also want to try leaving the broiler drawer or oven door slightly ajar during broiling to keep the environment from becoming too hot. Now that you know if your stove has a broiler drawer or an in-stove element, you may be interested in learning more about your household appliances. 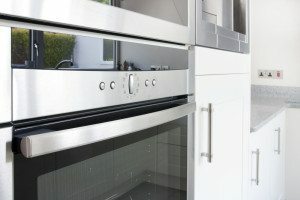 Contact the experienced professionals at Complete Appliance Repair in Salt Lake City for the best repair and maintenance service in northern Utah, as well as appliance sales and installation. Call us today for help with your stove broiler, or any of your other home appliances. This entry was posted in Blog and tagged Storage Drawer, Stove Broiler on October 13, 2015 by admin.